I know that I’m tired. In the last two weeks I’ve shown upwards of seventy homes. Many of those homes are lovely and well-priced but not the right fit for the variety of buyers that I’m working with. I’ve written four offers and one has been accepted. That’s a terrible average. I have two times out been faced with unmotivated sellers and their agents. Contemplating two properties, both have been on the market more or less for three years. Both are overpriced. Standard operating procedure is for me, as a buyer agent is to pull comparable home sales at time of offer. I did. In both cases I couldn’t find justification for price; so we generated an offer accordingly. With the first offer another competing offer miraculously appeared. The co-listing agent called around once my offer was in hand and shopped it. Legally right in NC to do so, with seller permission, however terms cannot be shared. Terms might have been shared, might not, I’ll never know. So legally this is right, ethically it’s pretty crappy and leaves a sour taste. Sadly, we didn’t get the house. Concerning offer number two, again comps won’t support price and the seller rejects our offer. Playing Mr. Nice guy, I ask the listing agent if she can send me comparable homes sales to justify her price, poor little ole’ me just can’t find them. Her response, a rather snippy; look at this area, look at that area, you’re on your own buddy boy. Um, hello! I did look at that area and this area, the translation; price cannot be justified. So, hence an unmotivated agent and seller and a home that is sitting on the market. I empathize with listing agents. I know it’s hard to look a seller in the eye and say, I know you believe your home is worth “x,” but the reality is it’s worth “y,” and here are comparable sales in your area that justify what I’ve just said. Real estate agents more so than any other field are loath to ruffle a seller’s feathers, after all we rely on them for our inventory and what if they go to someone else or fsbo or a limited service company or gasp, what if they ask us to cut our commission? So, with this off my chest and after a quiet Easter, tomorrow I’m off to show homes. 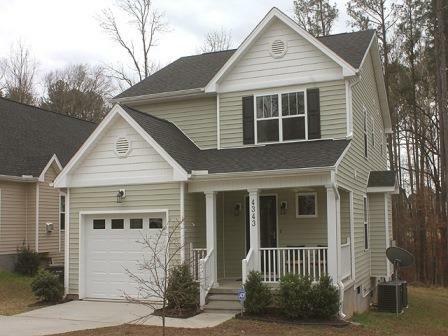 For Rent: 3BR/2 1BA Single Family House in Raleigh, NC, $1,550/month. Virtual Tour of this lovely home. Step through the front door of 4343 Jean Ave. and before you, gleaming hardwood flooring, crown moldings and a very chic and comfortable living room. Beyond that is a dining area that opens to a kitchen that just says wow. An abundance of Granite counter tops and Maple colored cabinets greet you. The appliances are newer and of superior quality. This is indeed a kitchen for cooking and living. This home is great for entertaining. Just off the dining area is a large rear deck which overlooks a gently sloping rear yard. There is designated green space behind this home. Upstairs are three generously sized bedrooms, a laundry and two full baths. There is a half bath downstairs. 4343 Jean Ave. has a spacious front porch too. The home is 7 minutes to Duke and about 7 minutes to UNC. Shopping, coffee shops and dining are within walking or biking distance. This home is clad in worry free and hassle free vinyl siding and Jean Ave. is a low traffic neighborhood street. There are NO home owner association fees. 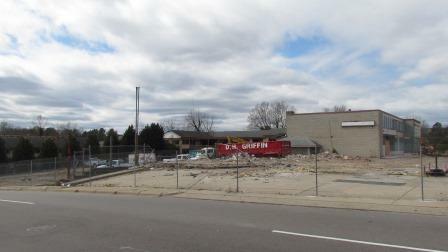 Today is a happy day for Durham, NC., the Urban Merchant Center, eyesore, welfare home and murder scene is being demolished. This horrible site, located just off the Durham Freeway (NC 147) on a gateway corner in downtown Durham, at the corner of Gregson/Vickers and Chapel Hill Streets; has pushed my fur the wrong way for years. The now departed owner, Ronnie Sturdivant, used his sign at the front of the building to push his somewhat twisted agenda and personal vendettas. Sadly, that agenda most likely got Ronnie killed at this very site. To say the site was ugly is an understatement. Rather the site was a constant reminder as to how easy it is for taxpayer monies to be squandered. Durham County at one time paid a hefty price to house indigent at this site. For years the site, directly across the street from the main Durham Police station was a thorn in the side of law enforcement too. I say a hearty and heart felt GOOD BYE.